The Convention kicked off with a difficult announcement from outgoing president Christina Lewellen, letting members know that negotiations on a new partnership with BHS have come to an end. The two organizations will continue to work together, but there will be no merger on the horizon. See the full announcement here. The mood immediately lifted, though, as a new international board was installed by representatives of Harmony's Youth Members. Donna McKay, Harmony Queen, director of the Crystal Chords, and longtime organizational leader was named the new International president. The contest excitement kicked off with 25 quartets taking the stage for the semifinal round on Thursday. Although the day was full of fantastic performances — including HALO singing Stevie Wonder, The Karamels as vampires, and High Five singing straight to the heart of every woman in the audience — only 10 could move on to the finals. Something Good finished in 11th with 71.6 and were Saturday’s Mic Testers. The competition continued to light a fire for the audience with a strong showing for all in the Chorus Finals on Friday. Nashua, New Hampshire's New England Voices in Harmony presented a Disney-themed set and won with a score of 79.7 percent. Although directed by Harmony Queen, Renee Tramack, the group performed without any on-stage direction, making their performance just that much more impressive. Jeanne O'Connor's Village Vocal Chords took home the silver with 78.9 percent and Jordan Travis' A Cappella Showcase finished in third with 78.4 percent. Area 5 had a strong showing with Limestone City Voices reaching fourth and Area 1's Sounds of the Seacoast earned the fifth-place medal. See the full scores for the chorus finals. 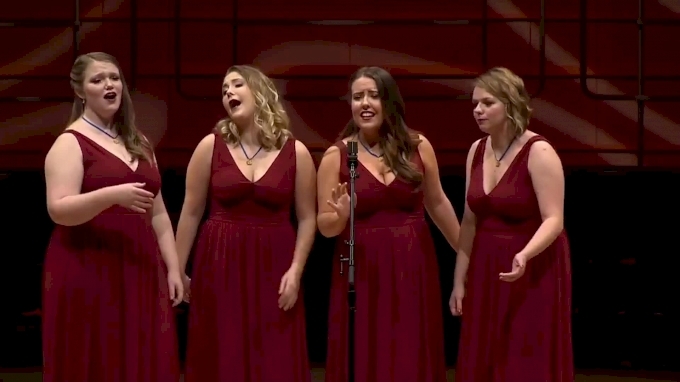 The top 10 Quartets returned to the stage on Saturday with an incredible showing across the board. The double mother-daughter quartet, Aged To Perfection, won the crown with a total score of 80.7 percent. T4, who recently finished 17th in the Sweet Adelines Quartet Content, finished second with an 80.0 percent. Lip Service from Area 3 finished third with 76.0 percent, while Area 2’s Balancing Act took fourth with a 75.2 percent. Fifth-place medalist, Tonic!, took home the Image in Harmony Award and the Accord Award. See the full scores from the quartet finals.